Former Trump aide Steve Bannon appears to have lost it, making all sorts of wild claims during a comprehensive interview with BBC News. 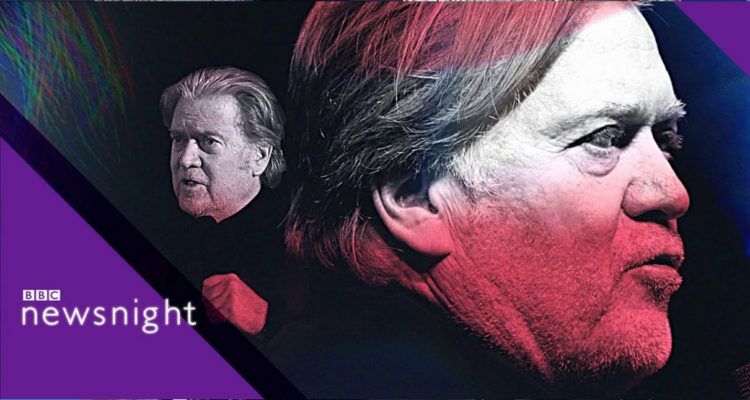 BBC News aired an interview with former White House Chief Strategist Steve Bannon on Wednesday. Bannon, who also worked as the former executive chairman of Breitbart News, made all sorts of wild claims – such as stating that slain civil rights leader Martin Luther King Jr. would have been proud of Trump. Reporting on the interview, Newsweek noted that, although the numbers may show improvement in employment rates for blacks and Hispanics, the rate of improvement has not altered during Trump’s administration. The unemployment rate for black people hit a record-low 6.6 percent in April 2018, according to the Bureau of Labor Statistics. Hispanic unemployment was at its record-low rate of 4.8 percent in the same month. But both rates have been in steady decline since peaking around 2011, and that fall has not accelerated alongside Trump’s presidency, which is partly defined by its vaunted crackdown on illegal immigration. “Dems did nothing for you but get your vote!” Trump tweeted in January, noting the falling unemployment rates for black and hispanic people. Bernice King, youngest child of civil rights leaders Martin Luther King Jr. and Coretta Scott King, weighed in as well in a multi-part tweet in which she accused Bannon of “co-opting” her father’s legacy to further is program of nationalist (racist) politics. #SteveBannon has dangerously and erroneously co-opted my father’s name, work and words. Bannon’s assertion that my father, #MLK, would be proud of Donald Trump wholly ignores Daddy’s commitment to people of all races, nationalities, etc. being treated with dignity and respect. You can watch Bannon’s remarks about MLK in the clip below, followed by the full interview.